Every time I see a mother out shopping with her children trying to keep her goals in mind while the young ones clamor for everything the mother is not going to put in her grocery cart, I recall my own moments. Children are born with taste buds already acclimated to junk food and parents battle their inclinations from day one. Children like recognizable food. If they can’t conveniently pick it up in their hands, they might not eat it. And, if the food, can be fried, grilled, or breaded, so much the better. Unfortunately, the week before payday doesn’t always allow us the luxury of chunks of meat or chicken. This is when the bane of most children appears . . . casseroles! Casseroles were invented when there was one shred of meat, two carrots, and a sprouted potato left in the larder. Whether it is a larder or refrigerator of today, we often have the same culinary scenario. This is when your motherly skills all come into play. For variation, all you have to do is add liquid to leftover casserole and you have soup. This is about as popular as casserole. Your children carefully skim tiny spoonfuls of broth from the surface of their soup bowls. There are whispered discussions and long, intent looks into their bowls. You get the impression that the appearance of the Loch Ness Monster from the depths of their soup would come as little surprise to them. All the cookbooks and meal planners suggest stretching meals with a big salad. Salad often fits into my week before payday budget. Unfortunately, the children are all for drowning it in their soup and covering it with brown, crusty stuff. Husbands should be supportive but, sometimes, they just can’t help what happens. Faced with a big bowl of mixed salad greens (two-pound bag on the ‘next stop, eternity’ used vegetable counter! ), he tries to be encouraging. Marriages are made in Heaven but I bet they happen before the salad course. Our Favorite at the Family Salad Bar! 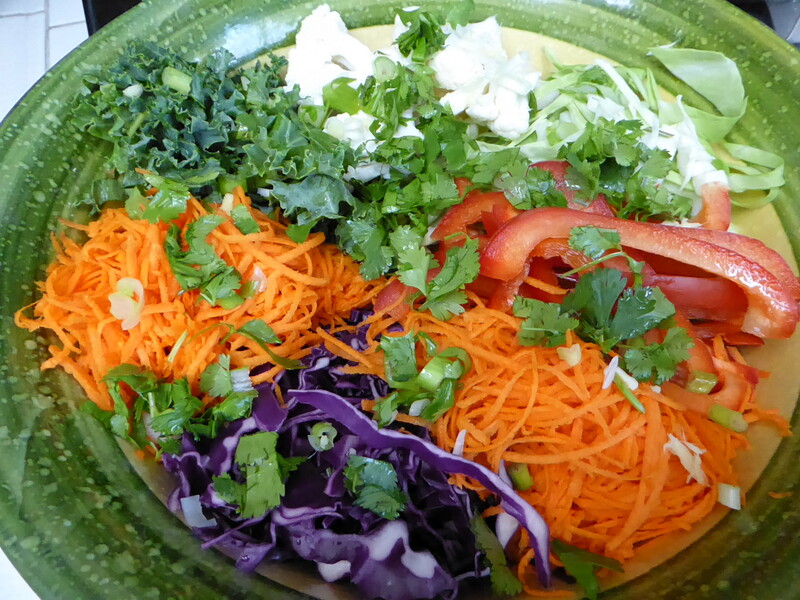 We enjoy salads in our family and are always trying out new combinations, dressings, and vegetables. The latest (pictured above) is the easiest yet most popular one yet . . . very few leftovers! The Dressing is easy and most people will have the ingredients already around the house. Dressing a little too thick for you? Just thin with adding a bit of water. Combine all the ingredients in a container you can seal and mix until smooth. Refrigerate until needed. It keeps well for a day or two. Prepare all your vegetables (You can add/substitute for other favorites) in a large serving bowl. When ready to serve, drizzle the dressing generously over the top of the salad ingredient and toss to coat evenly. toss with the dressing just before everyone helps themselves. side of rice . . . although no stopping you if you want to add that to the dinner plate, too!